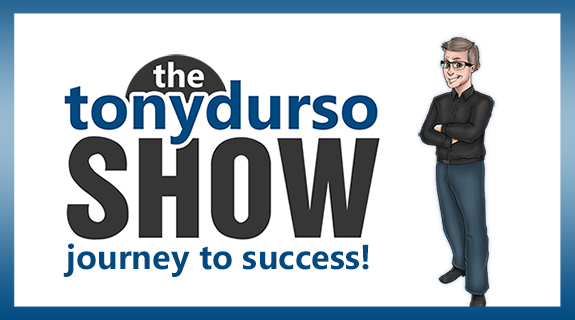 The Tony DUrso TV Show showcases successful entrepreneurs along with humanitarian endeavors and noteworthy projects. We share wisdom, advice and guidance with you to assist in transforming your career, business and your life. Featured are: Jean Ginzburg, Digital Marketing Expert; Rob Kessler, Inventor Million Dollar Collar; Jordan Goodman, America’s Money Answers Man. EP167. Dr. Greg Sommer: Award Winning Scientific Entrepreneur! Dr. Greg Sommer is the co-founder and Chief Scientific Officer at Sandstone Diagnostics. He’s recognized as a 2015 Bay Area “40 Under 40” by Diablo Magazine. He won numerous entrepreneurial competitions including the 2017 MedCity Invest Pitch Competition, 2016 Molecular Med Tri-Con Swimming with the Sharks Competition, 2015 UPS X-Port Challenge, and the 2013 Sierra Nevada Innovation Challenge. His company, Sandstone was also named a 2014 “Most Innovative Life Science Company” by the San Francisco Business Times. Levi King: Co-founder & CEO of Nav! Nav.com is a venture-backed company that helps small business owners get more funding and lower their costs. Prior to Nav, Levi King co-founded a business financing marketplace where he saw too many applicants get denied or only get approved for offers they couldn’t afford. His columns appear regularly in publications such as Inc., Entrepreneur, and Forbes and he is quoted in numerous news interviews. EP166. Aaron Agius: Grow Your Business With Inbound Marketing! Aaron Agius is the CEO of Louder Online, one of the world’s leading digital agencies with a global reach. His company works with global giants such as Salesforce, IBM, Coca-Cola, Intel and scores of leading brands. He’s a highly sought speaker at Search, Content Marketing, Growth Hacking and many other conferences the world over. And he is also a regular contributor to some of the world’s largest editorial publications, including Entrepreneur.com, Hubspot.com and many more. EP165. Eric Zuley: Being a Digital Trailblazer! Eric Zuley is a multi-award-winning entrepreneur: He’s published as the #7 top social media influencer in the world. The Hollywood Weekly Magazine awarded him the Digital Trail Blazer Award. He’s recognized by Congress and has an award named after him. And, Eric has a weekly TV show that hosts on many platforms such as the VoiceAmerica channel. Phillip Stutts has over twenty years of political and business marketing experience. He contributed to more than one thousand election victories of senators, governors, representatives, and two U.S. presidents. His agency won over twenty prestigious honors, including the award for Digital Video Excellence in a Presidential Campaign. Phillip is a regular guest on CNN, Fox News, and MSNBC, and is referred to as “a political guru” by ESPN and a “marketing genius” on Fox Business. EP164. Michael Nir: The Silent Language of Success! Michael Nir is a Keynote Speaker, Best Selling Author and Lean Agile Inspiration Expert. He has a master in engineering, certification in Project Management and training that all balances his technical know-how with emotional intelligence. And he’s an author of nine books on influence, consumer experience and Agile project management. Jessica Higgins: Organizational Culture Design Expert! Jessica is a public speaker, strategist and published author. She designs and manages the only end-to-end Culture Design firm in existence. She and her team work with Microsoft, L’Oreal, Zappos and many organizations who know that corporate culture is an irreplaceable competitive advantage. EP163. Jordan Goodman: Encore: America’s Money Answers Man! Jordan Goodman is well-known as America’s Money Answers Man. He hosts the national Money Answers Radio Show. He’s written 13 books on financial topics, including, are you ready, the Dictionary of Finance and Investment Terms. He was the Wall Street correspondent at Money Magazine for 18 years and the list goes on.